Visit three healthcare organizations that undertook the task of converting paper files to electronic documents. For medical facilities and practices that haven’t gone fully electronic, eliminating paper is always near the forefront of their thinking. But like many worthwhile goals, it takes patience and planning to make it happen. Decision makers need to be convinced, workflows need to be redesigned, and workers need to be trained. Nevertheless, HIM professionals generally agree that the resulting efficiencies outweigh the aggravation of making the switch. Although each facility may encounter unique challenges, there are some stumbling blocks that tend to crop up frequently. Talking to facilities that have navigated this process or are in the middle of it is one way to prepare for your own transition to an electronic environment. In spring 2005, this 806-bed, community-owned hospital in Florida with 805,786 patient visits to its services and physician practices began an ambitious project to tie approximately 120 systems throughout the facility to its clinical information system (CIS). If successful, the move would allow all clinical information to be accessed from a single user interface. But the CIS was unable to handle certain documents, such as document images, making a document management system necessary. The project required input from many areas of the medical system. In addition to enlisting the help of the chief information officer and the executive director of revenue cycle, who was the main executive sponsor, HIM worked with departments such as patient financial services and registration to develop and implement the plan. During this process, Streamline Health’s Access AnyWare solutions were chosen to handle document management functions such as scanning, release of information, registration scanning, chart tracking, and chart completion. The health system spent a year laying the groundwork for a phased-in implementation. In May 2006, the facility went live with scanning in HIM, registration, and patient financial services for items such as orders, consent forms, drivers’ licenses, insurance cards, patient discharges, and release of information. In August 2007, the facility implemented image enabling, making scanned documents available in the CIS. In 2008, full integration and chart completion functions—a collaboration between Streamline Health and Eclipsys (Allscripts)—were introduced. From a single interface in the CIS, physicians and caregivers can click on tabs to access all records. Physicians can also sign scanned and transcribed records without going into another system. In addition to eliminating paper and making records more accessible, the changes have helped Sarasota Memorial significantly lower a chart delinquency rate that once hovered at 50% and higher. While the benefits have been significant, there were challenges along the way. One was preparing the staff. The shift from paper to electronic can be awkward, and it’s important that everyone involved knows what to do. Michael says a well-prepared team can determine the success of not only a go-live but the entire program as well. Another challenge was preparing the scan center. At the time of the mock go-live, the scan center wasn’t completed. Rather than hold up the process, Sarasota Memorial chose to perform it in an area that wasn’t set up appropriately. Unfortunately, the processes didn’t transfer exactly from the makeshift area to the actual scan center, which affected the real go-live. Michael says if she had to do it again, she would push back the go-live date to allow the scan center to be fully operational for the trial go-live. The biggest challenge, however, was getting forms ready for scanning. Forms need to be redesigned for scanning and have bar codes attached, and codes need to be assigned to those bar codes. Michael says it’s important to emphasize form redesign early in the process because it takes longer than people anticipate and can significantly affect productivity. Much like Sarasota Memorial, this 672-bed organization located in the Dallas/Fort Worth area wanted interoperability within its electronic systems and EHR as well as the consolidation of patient information into one record. It also wanted to eliminate the need to transport records from an off-site HIM building to the main hospital campus and outlying community clinics, thus reducing the need for continuing off-site storage. Once HIM, clinicians, and top-level executives were on board with the goals, an electronic document management systems “core team” was formed. Composed of representatives from HIM leadership, HIM operations, IT, internal auditing, and vendors as well as a consultant and a project manager, the core team was responsible for all planning related to the transition and the go-live event, including training end users and testing. The detailed project plan listed necessary tasks, due dates for each task, and the person who was assigned to each task. It took a year from the time planning started until the go-live date. The core team selected Perceptive Software’s Image Now product for reading preprinted bar codes on forms, assigning bar-code values at the point of scanning, and digital photo capture, which is used to pull in photos taken by nurses. The technology is currently available in the dermatology department and will eventually be rolled out in wound care, plastics, and other departments. In January, Parkland Health’s HIM department went live with document imaging. Scanning is centralized to HIM for clinical documents with satellite scanning areas throughout the hospital. Scanning, which is performed entirely by HIM employees, takes place in the HIM and emergency departments, the ambulatory surgery center, inpatient clinical floors, and an outpatient clinic attached to the hospital. The implementation has brought about many changes. There is greater access to real-time information, and processes that were previously handled postdischarge are now taken care of concurrently with a patient’s admission. Documents such as patient questionnaires, patient statements of responsibility, and consents for treatment procedures and anesthesia are handled electronically. The need to shuttle paper records among the off-site HIM facility, the main hospital, and outlying clinics has been significantly reduced. Ingrassia says spending more time making sure documents were scanner friendly would have made the transition a little easier. Staff also encountered documents that had not been accounted for, which presented a challenge for HIM users when they needed to classify and scan them during implementation. For facilities preparing to adopt a document management system, Ingrassia recommends taking the time to account for all documents that need to be scanned, including those from other facilities. Concentrate on centralized scanning before moving on to decentralization, she says. Looking back, Ingrassia believes it would have been helpful to spend more time communicating with all users throughout the hospital to ensure they were aware of and prepared for the go-live date. A learning curve was expected, but better clarification of how the scanning process works and what functions it performs would have avoided some miscommunication. Solid communication practices are especially important because integrating a document management system with an EHR has far-reaching implications throughout a facility, Ingrassia says. Overall response to the new system has been positive. The HIM staff is becoming increasingly comfortable with its new tasks, such as associating a document type to a document rather than filing a paper document based on its order in a chart, Ingrassia says. Clinicians are becoming more comfortable locating documents electronically, she adds. Nevertheless, there have been some issues with bar-coded documents and patient labels that aren’t always recognized by the scanning software, according to Ingrassia. Also, HIM has received many provider requests to scan clinical documents while patients are still admitted instead of waiting for them to be discharged. Still, in general, workflow is more efficient than it was before the transition, Ingrassia says. Hoping to improve workflow and boost communication, Southeastern Orthopedics, an outpatient physician practice owned by Newton Medical Center in Covington, Georgia, decided to implement a document management system. 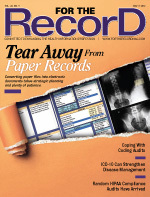 Although most of Newton Medical Center is using an EMR, the orthopedic office still uses paper. Coming from an electronic environment, Southeastern Orthopedics office manager Connie Hughes knew how much of a difference an EMR could make. And with a small, new staff, the need for electronic workflow was especially pressing. Hughes wasted no time enlisting her supervisor in the drive to switch to digital, and it didn’t take long to convince Southeastern Orthopedics’ doctors. Cintas’ ScanMD was chosen as the document management solution. To prepare for the go-live event, Cintas is working closely with the practice. The vendor is helping to evaluate the workflow and charts to help determine how the document management software will best suit Southeastern Orthopedics’ needs. Because the practice’s backlog of files, which includes one to two years’ worth in the office as well as another seven or eight years’ worth at an off-site storage building, is too large for Southeastern Orthopedics’ staff to manage, Cintas will tackle the back scanning. As a result, when the practice begins scanning, it will be able to start with current documents. The scanned documents will be transitioned to the EMR, and Hughes expects the scanning to take three to four weeks. Cintas is also providing training—the staff has already had a half-day system demonstration. Aside from the possibility of documents being scanned under an incorrect heading, Hughes doesn’t anticipate many difficulties. And because ScanMD can search by a single word, misfiled documents can be retrieved. Currently, there are no plans to use document scanning for other areas of the practice, but Hughes says they may decide to use it with billing. Although transitioning to a document management system isn’t easy, many who have done it believe the benefits are worth the extra effort. The reduction in paper and increase in workflow efficiency improve many areas of the healthcare enterprise. And it may also reduce the number of work interruptions. “Our physicians rarely come to HIM [anymore] unless they’re coming to say hello,” says Michael.